Structural Survey in France – this brief summary presents the traditional strategy for the treatment and prevention of wood rot within buildings. When undertaking a Structural Survey in France we adopt this approach in the recommendations. It is very similar to the approach for addressing wood worm. The process of wood decay is an essential part of the ecosystem, converting dead wood into humus. Were it not for this process, the forest floor would be full of dead trees. Wood decay is achieved by a combination of wood boring insects and wood rot. Damp resulting in wood rot. As the rot develops, it softens the timber allowing it to absorb more moisture. This makes it an attractive environment for wood boring insects that will further degrade the timber. Left unchecked, the rot will develop and compromise the structural capability of the timber. This may lead to full structural failure. Remedial work may be very expensive and disruptive if replacement timber is required, especially if the timber is recessed behind masonry and plaster etc. There are 2 key types of fungal attacks to wood, namely wet rot and dry rot. Both require elevated levels of moisture to be present in the wood in order to survive. However, dry rot requires less moisture to be present so is sometimes of more concern as it can flourish and quickly spread even in less damp conditions. 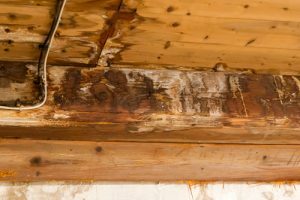 If the wood is dried to adequate levels (through addressing the source of the damp, combined with ventilation), existing rot will die in the drying process. Importantly the dried wood will become an unattractive environment for future fungal attack and naturally resistant to future attack. When undertaking a Structural Survey in France, in addition to reporting any damp issues that may be present, we also detail remedial options including repair works and modifications to address damp. We also provide care plans such as increasing ventilation, particularly in loft space where ventilation may be compromised. This will allow the overall structure to remain dry, including of stone walls that in turn will draw moisture away from timber embedded within the wall. An alternative approach to combat wood rot is to use modern chemical treatments. However, some timber may be inaccessible to treatment, for example concealed behind masonry or plaster. Where chemical treatment is recommended, this should always be undertaken in tandem to addressing any damp issues, with the objective of drying all areas. We are firm believers in the traditional approach of keeping the structure dry to effectively combat wood rot, and importantly provide a natural defence for the future. This approach is centuries old in the making will last for centuries to come. RICS Surveyor in France. Go ‘green’ with period property and ventilate, ventilate, ventilate!! !